The advice of the test makers is to schedule your GMAT for a date that is "at least 21 days prior to your application deadline." The registration fee is $250. Sometimes people find the fee shockingly high, but it's negligible relative to the size of your MBA investment. If you reschedule, you can do so, but it's not free. If you reschedule more than 7 days in advance, you will be charged a $50 fee. If you reschedule within a week, the fee is $250 - and that's the test fee to take the test, so you are essentially throwing away your initial registration fee. This is the first section of the GMAT and test takers need to finish this section in 30 minutes. This is an essay section where the test taker needs to write an analysis of the presented argument. AWA is not counted towards the overall 200-800 score. Instead, the score range for AWA ranges from 0-6, with increments of 0.5. 0: Unscorable. An essay that is totally irrelevant or makes absolutely no sense. 1: Fundamentally deficient. An essay that has shows little to no reasoning and has numerous errors in language, grammar, spelling etc. 2: Seriously flawed. An essay that shows poor reasoning skills, does not develop ideas, is disorganized and has frequent problems in language, grammar, spelling etc. 3: Limited. An essay that shows some level of analysis, but misses most important points, and has some language, grammar and spelling errors. 4: Adequate. An acceptable analysis of the argument, but contains a few language, grammar or spelling errors. 5: Strong. A well-reasoned, well-organized critique of the argument with only minor writing flaws. 6: Outstanding. An excellent, well-articulated analysis that has few or no writing flaws. Test takers will be given 30 minutes to finish the IR section on the GMAT. This section was added to the GMAT in June 2012. It requires a combination of both Verbal and Quant skills and is similar to the Data Interpretation (DI) section on the CAT. Just like AWA, even IR is not counted towards the overall 200-800 score and is evaluated on the range of 1-8. In this section, you will be provided with 37 quant questions which need to be solved in 75 minutes. Problem solving (PS): Questions given, and you need to calculate the answer. Data Sufficiency (DS): You need to interpret whether the given data is enough to solve a particular question. 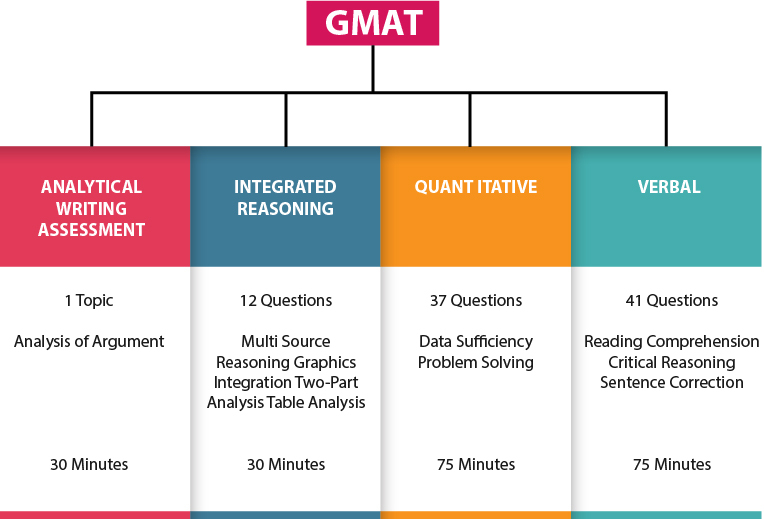 The Quantitative section of the GMAT evaluates your fundamental mathematical skills and your caliber to reason quantitatively. This is the third section on the GMAT. The test takers will be provided with 41 verbal questions which need to be solved in 75 minutes. Reading Comprehension (RC): You will be given a passage and you need to answer questions related to it. Critical Reasoning (CR): A short passage would be given. You need to find the premise, conclusion, assumption, etc. Sentence Correction (SC): A part of the sentence would be underlined and five options would be provided. You need to spot the error and mark the right option.